Easily reached from I-75 and St. Rt. 224 the Hilton Garden Inn Findlay boasts a convenient location near the University of Findlay and the Marathon Petroleum Corporation. Take advantage of our close proximity to many Findlay Ohio attractions. Explore Historic Downtown Findlay and discover beautiful architecture dynamic local businesses live entertainment and many charming shops and boutiques. Play a round of golf at the beautiful 18-hole Red Hawk Run or visit The Mazza Museum which is devoted entirely to literacy and the art of children*s picture books. 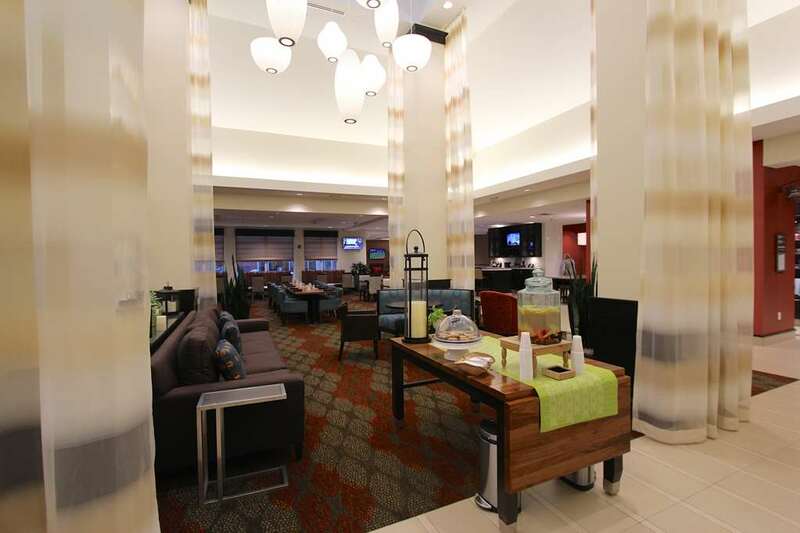 Feel at home in an inviting guest room or suite at this Findlay OH hotel. Work comfortably at the ergonomic desk and stay connected with complimentary WiFi. Watch HD channels on the 42-inch LED TV and listen to music through the alarm clock with MP3 jack. Make a hot drink with the Keurig coffee maker. Chill drinks in the mini-refrigerator and warm up snacks from the 24-hour Pavilion Pantry in the microwave. Stay productive in the complimentary 24-hour business center. Plan a meeting conference or wedding at this hotel in Findlay OH with a boardroom a divisible ballroom and contemporary A/V technology. Work out in the complimentary fitness center refresh in the heated indoor pool or take to the nearby walking/jogging path. After a busy day sip a cocktail or a glass of wine before enjoying American cuisine in the welcoming Garden Grille - Bar. Dine in the comfort and privacy of your guest room with room service /available until 9pm/.